Our Care Homes recent extension and refurbishment programme is nearing completion and the home now offers 28 bed accommodation consisting of a combination of single rooms, double companion rooms and single rooms with ensuite bathrooms. The new ensuite luxury bedrooms are of an above average size, fully furnished and stylishly decorated. Each room is fully equipped with a generous ensuite shower room with specialist facilities, a 24 hour call system and a TV aerial point. Our Standard bedrooms are also fully furnished and are equipped with washbasin vanity unit, 24 hour call system and TV aerial point. We invite all residents to make their rooms their own and bring some personal belongings with them. The home also boasts a brand new large communal lounge, which is divided into several sitting areas, furnished to a high standard and designed to create a homely environment. 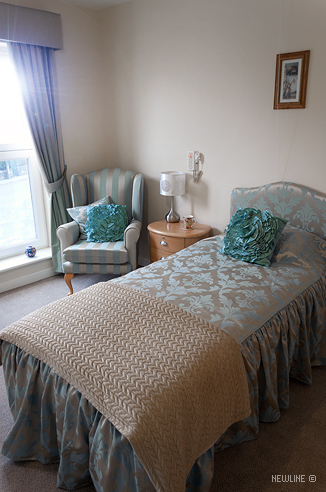 With a large adjoining dining room, garden and patio area Newline Care Home offers you a safe and comfortable residence that you can call your home. We encourage all residents to participate in our daily activity programmes, planned outings and entertainment events. It’s vital to our residents that they keep active both mentally and physically to make the most of every day. Our residents enjoy visits from religious and cultural representatives the local book club shop, clothes parties, pamper sessions, themed parties and much much more. Our resident's personal health and wellbeing is our top priority therefore we arrange weekly visits from the hairdresser, and regular visits from opticians, chiropodist and dentists. We can also arrange for physiotherapists and holistic therapists to visit. At Newline Care Home mealtimes are important to us we want them to be not only nutritionally satisfying but also be a sociable and enjoyable part of the day. We provide a varied, tasty and nutritionally balanced menu for our residents tailored to their individual nutritional requirements all home cooked with fresh, seasonal and locally sourced ingredients. We offer a different menu everyday with snacks and refreshments available anytime day or night. We offer a different menu everyday with snacks and refreshments available anytime day or night. We also provide daily personalised laundry and newspaper on request. If you would like to visit and spend some time with us at Newline Care Home this can be arranged. Although we strive to provide all the services and facilities of residents want and require, we always encourage feed back and suggestions.